These denim diapers are adorable and so chic! And they make for a darling diaper cake. 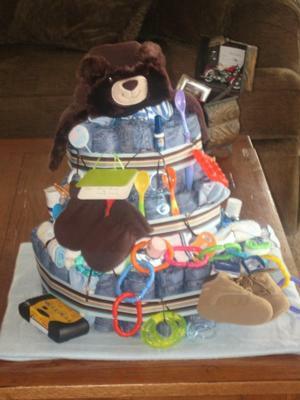 Jenny created this creative cake with a delightful assortment of baby items and decorations. Jenny's denim diaper cake is another cute source of inspiration of fun and creative diaper cake ideas for all of us. 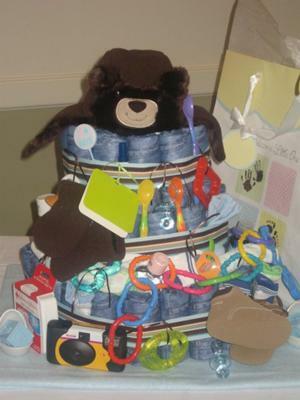 Our diaper cake gallery is loaded with cute & classy ideas - all submitted by our wonderful readers. We couldn't do it without them! Thanks so much for sharing your darling ideas, Jenny! Share your diaper cake with thousands of others, right here! I made a denim diaper cake for my sister-in-law's baby shower. They knew they were having a boy, and blue and brown was the color theme. I followed the directions from this site, added a few personal touches, and it turned out so cute! Inside the cake was a tube of wet wipes, 3 small bottles, and maybe 4-5 onesies! The "cake topper" was a winter bear hat. The decorations on the outside included spoons, links, hand sanitizer, baby oil, teething gel, a travel first aid kit, little work-booties, some teething rings, and a disposable camera. I was thinking of things that would go good in a diaper bag! I had a blast being creative with this!